Disney Cruise Line announced the early 2020 itineraries today with quite the well-deserved flair. 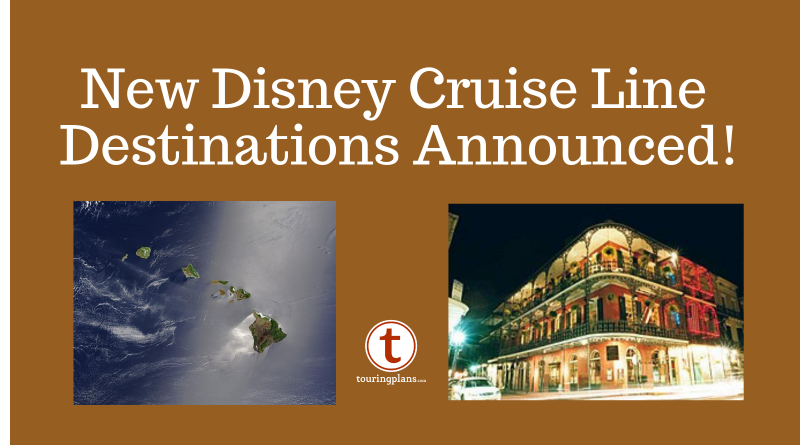 After 5 years, DCL is going back to Hawaii, and for the first time, New Orleans! The Disney Wonder was the star of today’s announcement, and she’s going to be quite busy! She’ll start off the year in Galveston but quickly head to San Juan for a few 7-night Southern Caribbean sailings. On February 2, 2020, she will leave San Juan for a repositioning and arrive for her inaugural call to the port of New Orleans on February 7! The Wonder will spend the rest of February out of New Orleans, with a variety of 7-night Bahamian, and 4-, 6-, and 7-night Western Caribbean sailings. On March 6, 2020, she will depart on a 14-night Westbound Panama Canal sailing. After arriving in San Diego, she will sail 2-, 4-, and 5-night Baja cruises, along with a couple 7-night Mexican Riviera itineraries. The Wonder will leave San Diego on April 24, 2020, and head north on a 5-night repositioning cruise to Vancouver. On April 29, 2020 she will say goodbye to the mainland and embark on a 9-night repositioning to Hawaii! There will be one more chance to experience the island on a 10-night repositioning from Honolulu to Vancouver on May 8, 2020. The Disney Magic will based out of Miami for the early part of 2020. She will embark on a series of 4- and 5-night Bahamian sailings, as well as 5-night Western Caribbean sailings. There’s also one 3-night Bahamian perfect for a quick getaway! The Disney Fantasy will be sailing 7-night Eastern and Western Caribbean itineraries. There will also be one 8-night Eastern Caribbean sailing from Port Canaveral on March 21, 2020, and one 6-night Western Caribbean sailing from Port Canaveral on March 29, 2020. All Fantasy cruises will include a day at Castaway Cay. The Disney Dream continues to be faithful to her 3- and 4-night Bahamian sailings from Port Canaveral to Nassau and Disney’s private island, Castaway Cay. Booking opens on Monday, October 1, for Platinum Castaway Club Members (guests who have sailed with Disney more than 10 times) and Golden Oak residents. Gold Castaway Club Members (guests who have sailed more than 5 times) can book on Tuesday, October 2. Silver Castaway Club members (guests who have sailed with Disney Cruise Line at least once), Adventures by Disney insiders, and Disney Vacation Club members can book on Wednesday, October 3. Everyone else can book on Thursday, October 4! You will be able to book online, over the phone, or with your travel agent. It’s important to note that if you currently have a placeholder that you would like to use on one of these sailings, this can only be done over the phone or with your travel agent. Have you already compiled your wish list of sailings you’d like to be on? Let us know in the comments.